This is really nothing new and yet nothing is being done about it: we, Venezuelans, have the highest death rate when it comes to road accidents in South America - by far: almost 56 men get killed on Venezuelan roads per 100 thousand inhabitants on a yearly basis (the rate for women is lower everywhere). It is time for this to change. I got the data from WHO (2008). You will almost never see a simple map like this or a chart in the Venezuelan media, which is a pity. There is nothing like visualizing numbers. So we don't only have now the highest murder rate of our sub-continent but also the highest death rate by stupid, mostly very aggresive driving. I think this shows a general attitude that has permeated society and has become worse with the years, the car and the petrol prices. It also reflects the fact tests for driving licenses are an absolute farce in the and of Grace. It shows there is almost no road control unless some cops need to round up their salary. 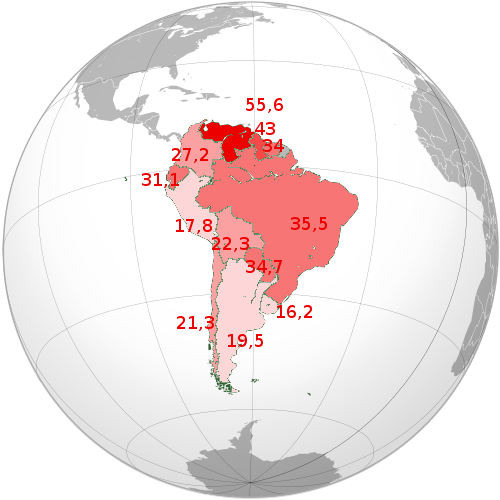 Venezuelans know about the latest music rythms from the USA or Sweden, Italy or Chile. They know how fashion is in Italy right now. They, on the other hand, very seldom try to compare how their country stands with regards to issues that have to do with life and death. Hi, Self-Exiled in Canada. That is very true. Things won't improve as long as we have such abysmal public transportation system and the petrol prices we have. Neither the government nor the opposition want to talk about these topics. I think the lack of traffic law enforcement plays a significant role in this high number of deaths in road accidents. You would see a decrease in deaths if Venezuelan drivers knew that there is a real possibility of getting a strong fine or have their vehicle impounded due to a serious traffic violation. Venezuelans are not afraid of fines because the chances of getting one is zero to none right now. I'm still in Venezuela. If I have a chance to take some pictures I will send them to you. In the mean time, I leave you this link to Rayma´s depiction of the motorcycle as a "family vehicle"
last but not least, there should be immediate flow of information to show people how many casualties each region is having, where exactly and so on. One could map this and then make inquiries, ask the governor or the minister: why do we have a rate of X dead per year when the neighbouring countries have less than half of that? What are you going to do?